Today and yesterday saw the critical parts of our queen rearing procedure taking place. Or to my mind the scariest parts. For the morning session we had myself, Tony, John, Dianna and Ian in attendance. 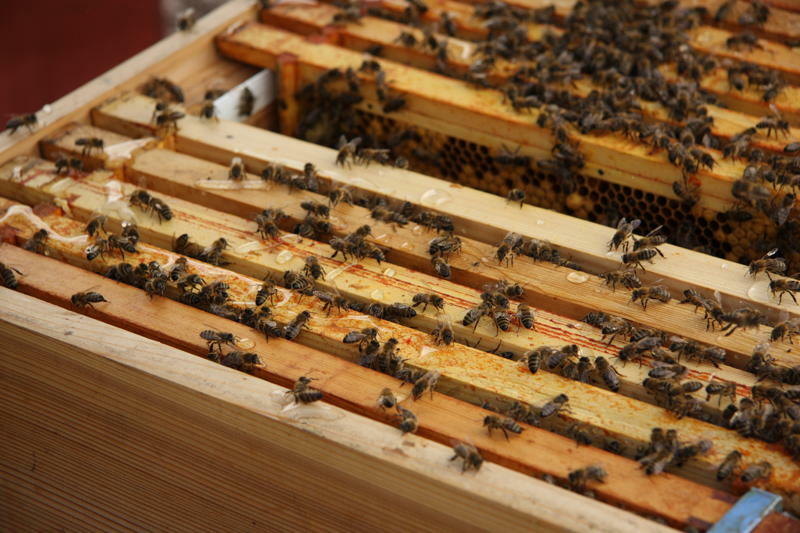 The plan was to rearrange the colony to make the bottom brood box (full of young bees after last week’s manoevres) queenless and place the queen and the bees with her in the top box over a split board. For those who don’t know a split board is basically another floor which separates the top storey of a double brood box hive and gives the upsatirs bees their own exit. 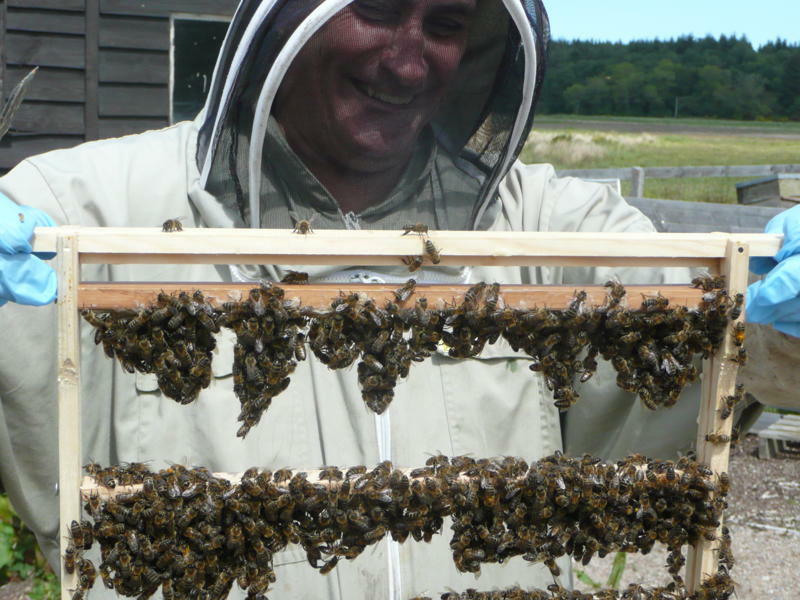 So before we swapped the position of the brood boxes over and introduced the split board we had to check the upper brood box for queen cells and destroy any found. The bees in this box had moved up to accompany the brood but had been separated from the queen by queen excluder since last week. 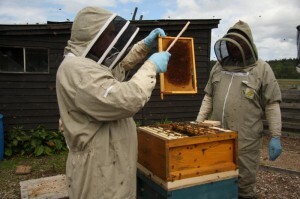 As you can see we found some and I, in my wisdom and seeing how keen the bees were to build queen cells, was heard to utter the immortal phrase, “I think we’re on to a good thing with these bees”! Needless to say Tony was to quote this back at me on a number of occasions as the day proceeded! 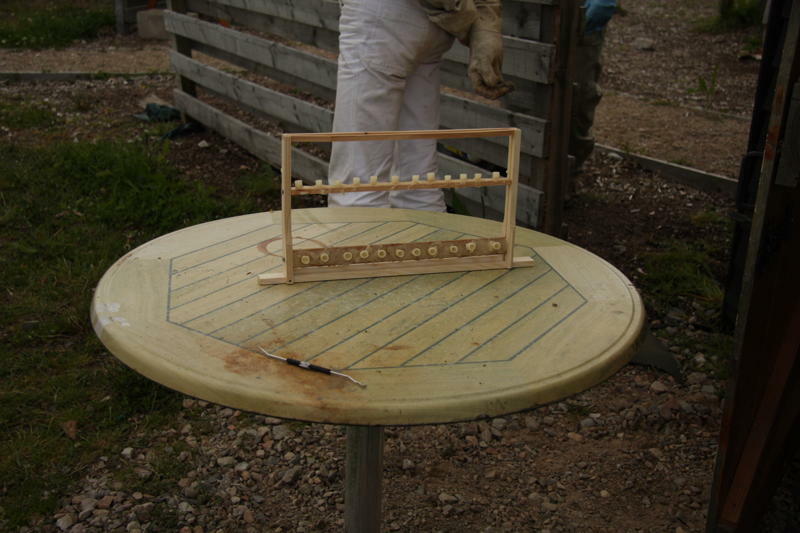 A gap was left in the bottom queenless box for the frame of grafted larvae to be put into in the afternoon. 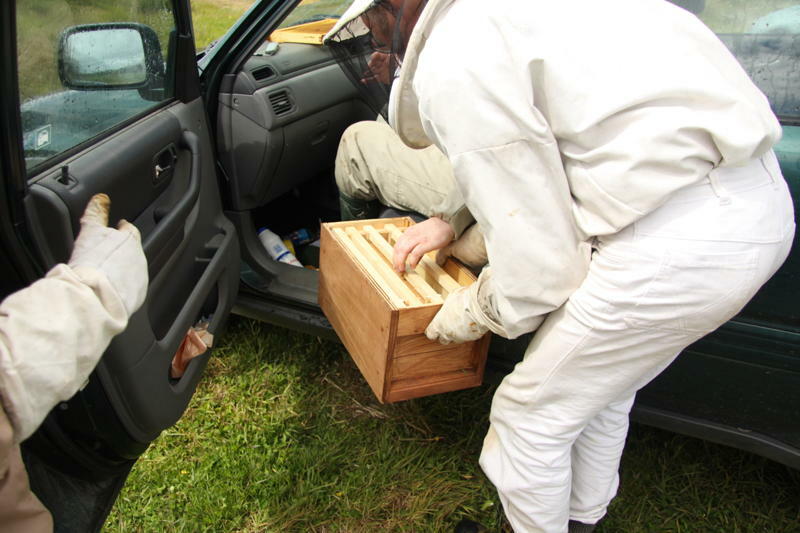 After making sure the queen was in the top box we went our separate ways to return in about 3 hours for the grafting, by which time the bees in the bottom box would realise they were hopelessly queenless and eagerly accept our grafts (well that was the theory anyway!). Some of us were a bit more active than the others in the interval. Above you can see John spending his time fixing our leaky roof and getting stung on the cheek for good measure! 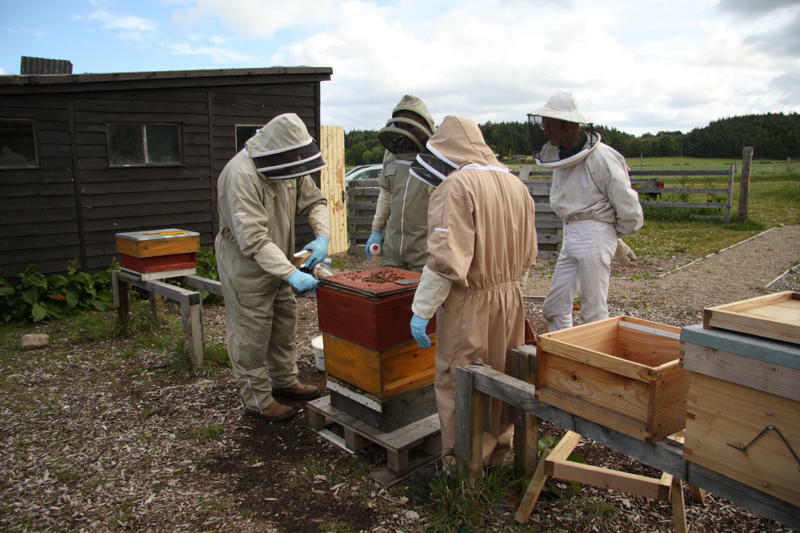 In the afternoon we all returned and were joined by Arlene from our last introduction to beekeeping course. Now it was time for the part of the process I was most worried about – the grafting. I had made some wax queen cups and waxed them on to a modified frame with two bars to hold them. And now it was time to take the plunge. I had been really keen to try grafting but now I wasn’t so sure. 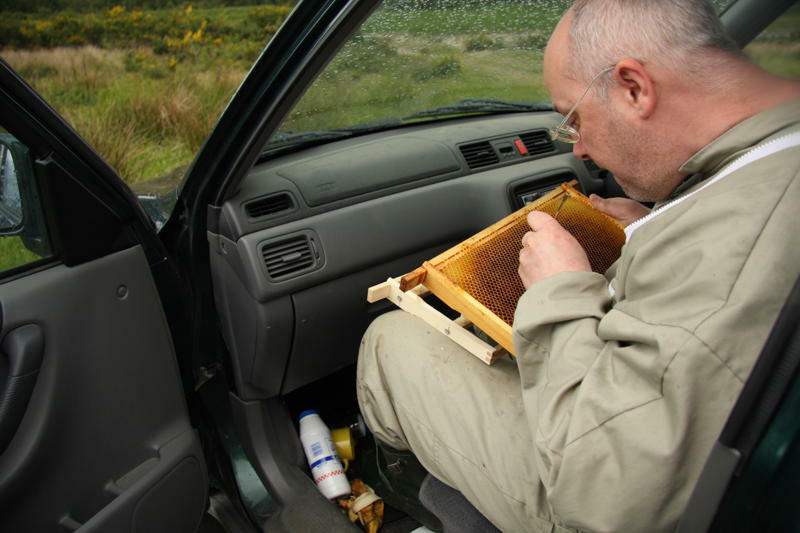 Given the weather was typically Scottish and it had in fact been hail-stoning about an hour before we had to resort to grafting in the front seat of Tony’s car – far from ideal! 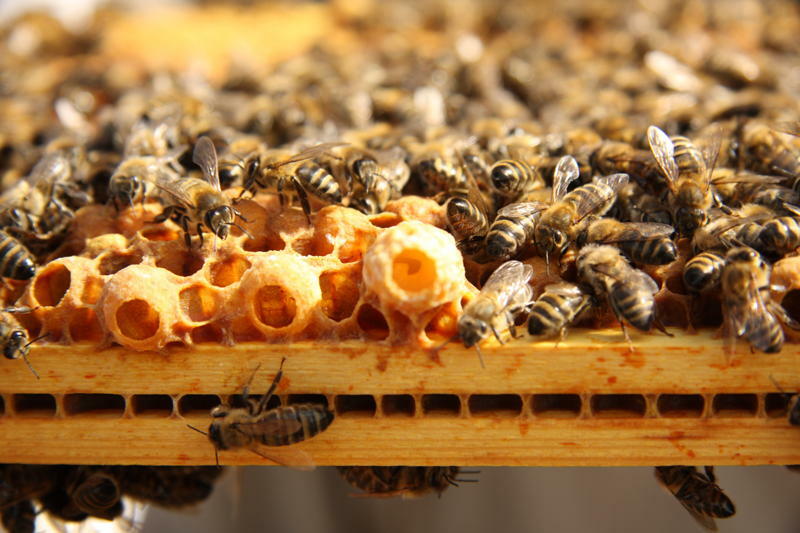 Vince Cook advises that it’s much easier to graft from larvae in relatively freshly drawn comb but the best candidate from the combs of unsealed brood we had was a fair bit darker than I’d have liked. My plan was to cut down the row of cells below the larvae I wanted to graft to allow easier access. But the old comb was harder to cut and didn’t break or fold cleanly. Making the best of it I ploughed on. I’d like to say that grafting was easy and the larvae all lifted cleanly and slid off gently into their new cells. Well the ones I successfully lifted were very gently treated but I’m sorry to say there were a good few that I rolled or otherwise damaged and had to be discarded. 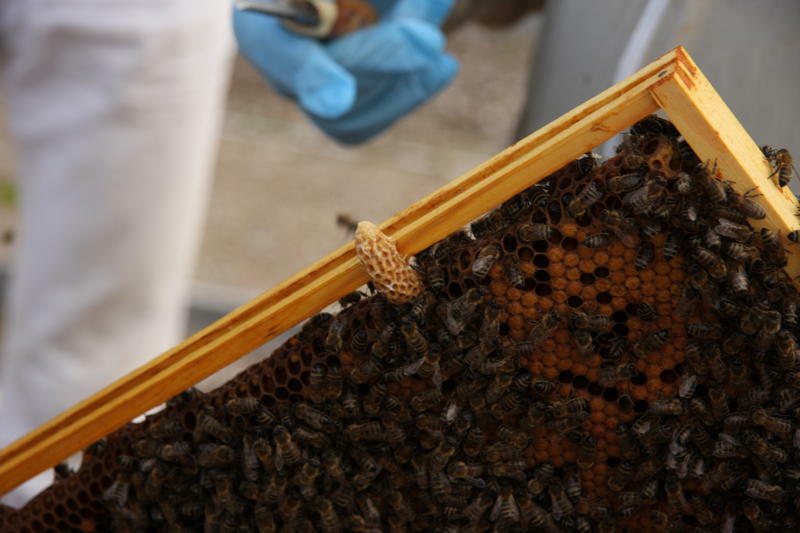 After what felt like an age I had all the cells filled with the smallest larvae I could find and off the comb went back to the cell raising colony protected from the wind by a nuc. I must say I wasn’t at all hopeful of the success of the grafts and worried about them for the following 24 hours. I was certain we’d have to go through the whole process again or that we’d only get 3 or 4 larvae accepted by the bees. 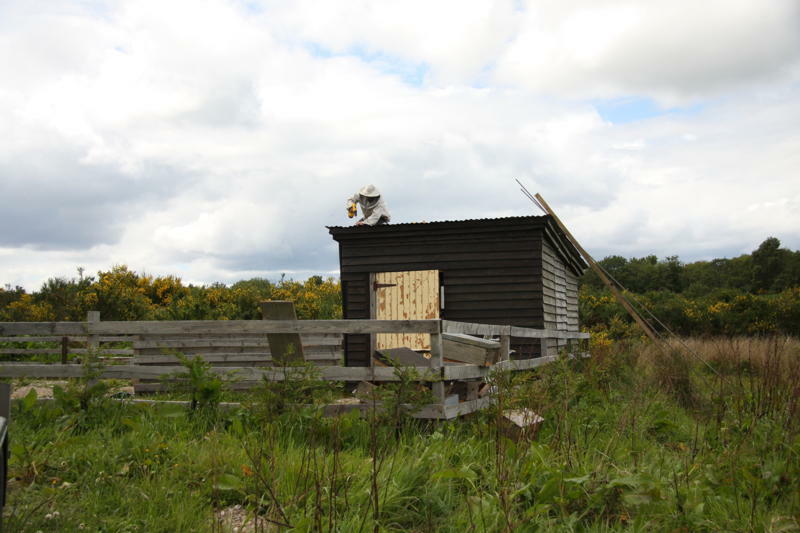 Well back we came again today to see what the score was and……..
We didn’t brush the bees off to check the acceptance rate in detail but pretty much the whole of the top bar of grafts had been accepted and it was much the same on the bottom bar. To say we were pleased is a big understatement! 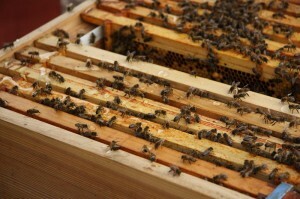 We’ll be back again in just over a week to make up nucs/mininucs and give each a sealed queen cell. Then all we have to worry about is them mating properly – but the finish line is in sight! I am SO impressed. This is just what we need in Moray. Many Congratulations. V.
Excellent blog! Whose the handsome chappy holding the frame of accepted larvae in the last photo?